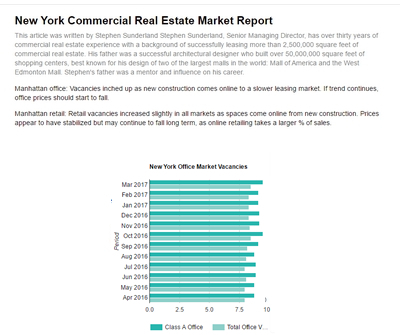 The year-end review of Manhattan commercial real estate casts doubt on 2010's outlook. 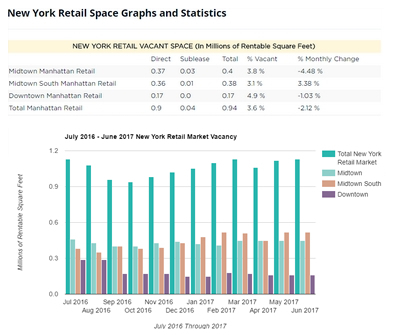 Commercial property sales volume was weak through the end of 2009, with projections suggesting that the total volume for the year was just $5.7 billion, a decline from $23.6 billion in 2008 and $62.8 billion in 2007. 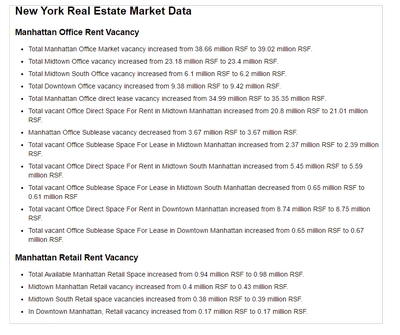 Manhattan commercial property sales volume remained slow through the end of 2009. Total commercial property sales for the year were just $5.5 billion, down from the peak level of $62.8 billion in 2007, and less than a third of the total sales made in 2008. There is pent-up energy in the market but watchers should remain cautious. Banks remain tight on lending, but some are starting to load loans bought or made during the peak. They are a growing number of office towers that are not quite alive but not entirely dead. They are New York's City's zombie buildings. Within the commercial real estate world, once a building is known as a problem site, it has a difficult time shaking off the negative label that is attracting tenants and finding rental income to nurse itself back to health. 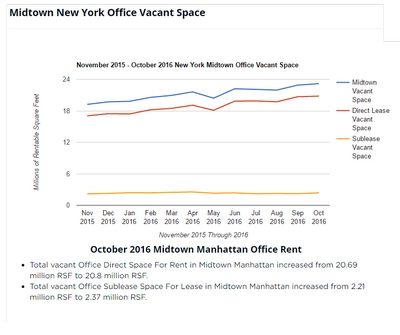 The volume of new relocation deals for large blocks of office space in Manhattan fell by 71 percent in the fourth quarter of 2009 from the third quarter, as tenants remain in their current locations instead of moving. 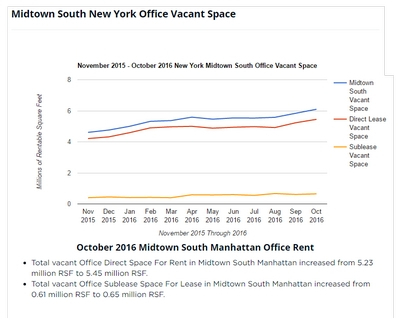 There was 603,175 square feet of new space leased in large deals in the fourth quarter in Manhattan, down from 2 million in the third quarter. 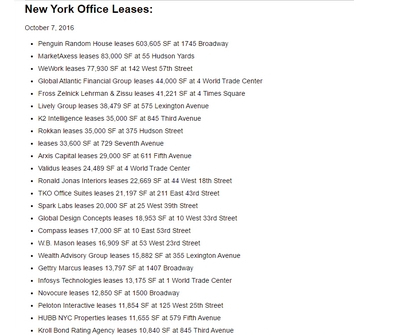 New leasing for large deals of 50,000 square feet or more was only slightly behind the 702,086 square feet leased in the second quarter, a period considered very weak. Tenants were opting to stay to save money. Although there are some great deals out there, most do not want to take the expense of moving to take advantage of it. The majority of deals are renewals and downsizing. For more than a year, foreign investors have been sitting on the sidelines waiting for a sign that the capital markets were beginning to thaw and the time was right to invest in New York real estate. One of the first tests for them may be coming from the Sorgente Group, a Rome-based investment firm that has already acquired some of the city's most iconic properties and is currently negotiating to buy the Woolworth Building in Lower Manhattan. With interest rates and prices at substantial lows, investors have been coming to distressed U.S. commercial real estate properties from all sides. China Investment Corporation controlled by the government, for one, is looking at opportunities. The FDIC auctioned off a portfolio of commercial property loans from failed banks for $1 billion, or 44 cents on the dollar. The fact that foreign banks, private equity firms and investment funds are taking notice of U.S. commercial real estate opportunities is a positive sign for the troubled sector. Still, some warn that there have not been enough deals to rival the amount of commercial real estate debt that needs refinancing. 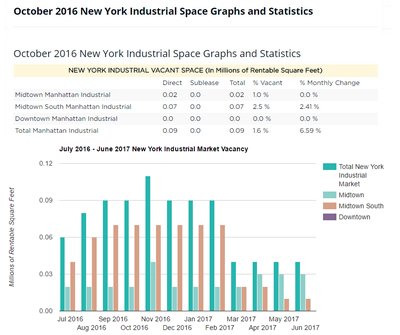 The total sales volume for commercial properties in New York City was down in 2009, with $6.3 billion in property transactions. Sales fell by 75 percent from the $25.3 billion sold in 2008 and was 90 percent off from the $62.2 billion sold in 2007. Sales volume should increase this year. Transactions will come in the form of slow rolling waves of distress over an extended period of time. Retail sales declined 9 percent in 2009, a move that caused chain brands, like Circuit City and Linens 'N Things, to buckle under the pressure. But their unfortunate could be some brands' opportunity. The overall retail malaise has led to a massive drop in asking rents. There is going to be a lot of opportunity out there. Companies are not as aggressive as they might have been in years prior, but they're not being conservative either. Thrifty-minded brands like the Dollar General chain, McDonald's, Sonic, and Kohl's are poised to take advantage of the vacancies left by shuttered companies, with more landlords willing to negotiate terms and rates on leases. The Nolitan, a 60-room hotel going up in Little Italy's historic district, is too tall for the neighborhood. The nine-story hotel on the corner of Kenmare and Elizabeth streets is in a zone that only allows for eight floors, or 85 feet. The developer did not count the ground floor as one of the building's levels. The building is, in fact, nine stories, not eight. The DOB's decision is not final; so the developer can appeal it through the city's Board of Standards and Appeals. A new sidewalk shed design was unveiled. The new proposed sidewalk structure marks the first time in 60 years that the protective structure between pedestrians and construction was redesigned for New York City. The design was chosen from the International Design Competition that drew more than 164 submissions. The wining designer had pitched the design to the competition, a structure that utilizes an arch-like frame. The State Supreme Court judgment denied Columbia University the right to use eminent domain in its $6.3 billion expansion project. The Center for an Urban Future is urging policymakers to take an aggressive look at how the proposed project could aid the financial landscape of the community. Columbia University officials plan to continue their 17-acre Manhattanville campus expansion, despite a court defeat which prevented them from controlling 100 percent of the planned area. The school still controls 94 percent of the area and will continue with the utility, demolition, and construction work that has been going on. A Columbia-owned building at 3229 Broadway at the corner of 129th Street will still be demolished and the adjacent gas station will become the Jerome L. Greene Science Center. Construction will commence on the subterranean which would connect all the buildings. The investor who acquired Kent Swig's failed Upper West Side condominium conversion site on 92nd to 93rd streets in 2008, is facing a $53 million lawsuit to foreclose on the property and place the buildings into receivership. The owners were accused of defaulting on the mortgage loan and failing to pay thousands of dollars in taxes and allegedly signing an unapproved lease with a retail tenant. SL Green Realty has taken sole ownership of 100 Church Street, the 1.05 million-square-foot office tower in the Financial District that is 58 percent vacant. The Sapir Organization defaulted on its loan, after which SL Green took over the building's management and leasing. SL Green had taken over a 50-50 ownership stake of the property with Gramercy Capital for just $10,000, with an agreement to work out the $145 million senior mortgage from Wachovia Bank. Gramercy has since declined to fund its share of the capital to extend and restructure the debt, and instead transferred its interest to SL Green. Hachette Filipacchi, the publisher that lost out to Avon is in talks to take over several floors at 777 Third Avenue, and may close in on a deal at the 48-story Building at 1271 Avenue of the Americas. The contract would be for 132,000 square feet of space previously occupied by Lehman Brothers, which had subleased the three floors from Time Inc. Hachette would be downsizing from its 263,010 square feet at 1633 Broadway. Deloitte is also expected to vacate 1633 Broadway, which could leave the door open for television network A&E at 235 East 45th Street. A&E is in the market for 350,000 square feet of space and may be looking at the Empire State Building and Worldwide Plaza as well as the Paramount's building. While most U.S. banks are still tightening their credit as they reel from commercial real estate losses, foreign banks like Bank of China are stepping in to fill the gaps in debt financing. 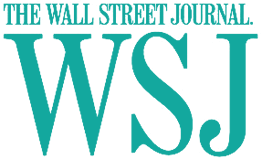 Foreign banks provide more than 60 percent of all commercial real estate debt financing in the country, and Bank of China granted a $120 million loan to W.P. 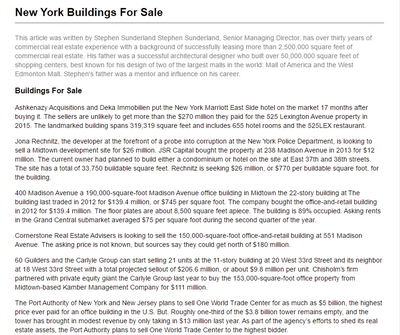 Carey for 750,000 square feet at the New York Times Building. SL Green Realty refinanced its Times Square office tower at 1515 Broadway for $475 million which was one of the largest financings by a bank syndicate over the past year and a half. Bank of China led the group by putting more than half of that $475 million on its books. Investment management group BlackRock purchased commercial real estate services firm Helix Financial Group, prior to that AllBridge Investments had been the lead stakeholder in the Charlotte, N.C.-based Helix. The 120-employee, approximately six-year-old firm has underwritten over $100 billion in commercial real estate loans since it was founded. There are around 100 new hotels to open in major U.S. cities and 46 of them will be located in New York City. These include five from Marriott under the Courtyard and Fairfield Inn brands and six from Starwood under the Sheraton, Four Points by Sheraton. A new hotel can take two to four years to plan and one to four years to construct, so most developers for this year's hotels were taking their chances several years ago, when the economic outlook was much rosier. Hyatt opened a 253-room Andaz hotel at 75 Wall Street. The company plans to open another Andaz on Fifth Avenue and 41st Street. This year will be a big one for new hotels, there are few properties scheduled to come online between 2011 and 2013. Avon has been angling for nearly 250,000 square feet at the 777 Third Avenue. For the 15-year lease on floors two through 11, Avon will receive one year of free rent, after which the company will initially pay in the low $40s per square foot. Rent will gradually increase to the low $50s per square foot. Avon is currently located at 1251 Avenue of the Americas, and plans to move to 777 Third Avenue in 2011. New York University bought the Forbes building at 60 Fifth Avenue at 12th Street for $65 million, or $530 per square foot. The building was close to a deal for $55 million. The price is 53 percent off the listing price when the 122,500-square-foot building hit the market in 2007. U.S. real estate debacles can lead to global financial losses. The Government of Singapore Investment Corp. lost $100 million in the Tishman Speyer-BlackRock Realty travesty at Stuyvesant Town. In the financial downturn, foreign investors are now shying away from the U.S. real estate market, an industry that was once thought of as a sure thing. Some notable names, such as Norway's Government Pension Fund, the China Investment Corporation and Dubai World, have all sustained major losses in the market crash. The turn of events has led some foreign investors to rethink their strategies. For the last two years, the Blackstone Group, the world's largest private equity firm, is starting to go property shopping. As it begins to deploy its $12 billion distressed asset fund, many are watching to see what kind of real estate it is buying and what else it is in the market for. The Manhattan-based firm agreed to pay about $191 million for a 60 percent stake in two malls owned by the Ohio-based Glimcher Realty Trust, a real estate investment trust with properties in 13 states. That followed a deal in September giving Blackstone 50 percent of the Broadgate office development in London, the largest office complex in the city's financial district, for about $127 million. Also, Blackstone agreed to buy 148 properties from assisted-living-home operator Sunwest Management of Salem, Oregon. The James New York, part of a new boutique chain owned by Denihan Hospitality Group, is to debut this summer, one of several hotels opening in the city despite the struggling commercial real estate market. Room rates will begin at $329 per night at the 20-story, 114-room hotel, which will be located on the corner of Grand and Thompson streets in Soho. The third-floor lobby will have views of LentSpace, a public art park across the street, and the roof will have a pool and lounge. 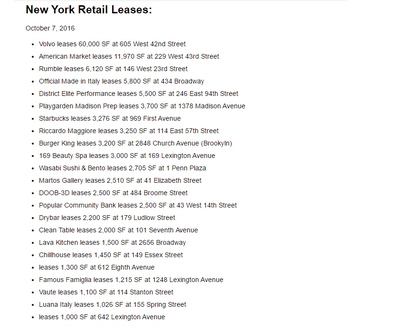 The owner of 420 Fifth Avenue has been waiting the market out before filling retail space there. Instead of doing everything to find tenants and taking lower rents, they have decided to sit on unused space. They are waiting to get the best tenant at the best rent, because once they commit to a 10-year transaction, they do not want to commit to a very low rent. The plan announced two years ago by advertising agency Ogilvy & Mather to move from Worldwide Plaza to 636 11th Avenue has hit a rough patch, with the new landlord allegedly trying to kick the company out. Ogilvy Group, a subsidiary of Dublin-based WPP Group, claims that 636 11th Avenue building owner is threatening to terminate the $600 million, 20-year lease, so the ad agency sued the ownership entity to block any eviction moves. Ogilvy Group claims that the owner has not completed parts of agreed-to tenant improvements, leading the ad firm to claim the landlord owes as much as $50 million in rent abatements and other damages. Ogilvy says it is not in default. Toll Brothers has been hit with a lawsuit by the owner of 363-379 Bond Street, the site of its planned mixed-use condominium and retail development alongside the Gowanus Canal. The developer entered a contract to purchase the site in September 2004, making a down payment of $5.75 million on the purchase price of $21.5 million, later revised to $20.6 million. The deal was contingent on the city's approval of a rezoning plan that would convert the property from manufacturing to residential, which was granted last March. But when the Environmental Protection Agency sought to add the Gowanus Canal to its Superfund National Priorities list one month later, Toll Brothers had second thoughts, refusing to close the transaction because such a designation would make the site unmarketable. Canal Theater is to become a cultural center that could help revitalize the neighborhood still struggling to recover from Sept. 11. The building's owners have agreed to launch feasibility studies for a development project that would create a performing arts center in the long-closed 2,300 theater on the corner of Ludlow Street, built in 1926. The group has already received $150,000 in grants to study the project after Sept. 11 from the Lower Manhattan Development Corp., and has allowance of another $140,000 for additional plans for Loew's. Five months after taking back 100 Church Street from the Sapir Organization, SL Green and Gramercy Capital won the auction to take over the Lower Manhattan office tower for only $10,000, as investors grew leery of millions of dollars in debt and empty space at the troubled office tower. SL Green, the former owner of Gramercy Capital and a current investment partner, will share 50-50 ownership of 100 Church. SL Green took over management and leasing of the building in August, and will remain in that role. The new owners must also work out the defaulted senior debt, a $145 million senior mortgage from Wachovia Bank. The expected the company to acquire additional properties through similar mezzanine auctions. Kohl's is moving its New York design office from 1395 Broadway to 1400 Broadway, a location with more than twice the space of the original office, at 38th Street. The discount department store brand will open its new design space in June, and will use the space to manage its licensed brands, including Candies, Chaps Home, and Simply Vera, a spin-off of the popular Vera Wang line. Kohl's will lease the entire 19th and 20th floors, encompassing approximately 60,366 rentable square feet. A popular gay Spanish hotel chain will open its first New York City location in 2011, On Top Magazine has reported, with a possible Miami location planned as well. Axel Hotels, an international chain with outposts in Barcelona, Berlin and Buenos Aires, did not confirm the exact address of its new hotel site, but said that it will be located in the Hell's Kitchen neighborhood. The news is seen as a coup for city tourism officials, who have been courting gay travel with a nearly $2 million ad campaign celebrating the 40th anniversary of the Stonewall Riots, a 1969 Greenwich Village protest identified with the start of the gay rights movement. The New York City location is part of the chain's recent massive expansion effort -- Axel Hotels plans to open new outposts in Amsterdam, London and Paris in the near future. Embattled developer Joseph Moinian has restructured the debt on three of his Downtown properties, 180 Maiden Lane, the Ocean Residences at 1 West Street, and 17 Battery Place. In total, the restructuring covers about $550 million in debt. His firm renegotiated the $340 million mortgage and mezzanine loans on 180 Maiden Lane, while nabbing a $130 million first mortgage on the Ocean Residences and a loan extension on the Battery Place property. The Chetrit Group paid $34.925 million to buy a leasehold interest on a portion of the ground under the former Standard Oil Building at 26 Broadway in Lower Manhattan, a building it bought two years ago. Midtown-based property investment company Chetrit Group bought the 31-story office building at the corner of Broadway and Beaver Street, as well as two out of three parcels of land under the building in 2007 for $225 million. But the third parcel, known as the Smathers Parcel, remained under separate ownership through a long-term lease. Developer Harry Macklowe has brought on CIM Group, a Los Angeles-based private equity firm, to pay off the creditors at the former Drake Hotel site, a move that would allow him to effectively take control of the space. Approximately 10 different investors had bought out the $510 million loan that Macklowe had taken out to build on the former hotel's site on Park Avenue between 56th and 57th streets. Deutsche Bank began foreclosure proceedings on the space a year ago, after the credit crisis pinched Macklowe's holdings. Macklowe had originally purchased the Drake Hotel in 2006 for $418 million, before destroying it and beginning plans to rebuild. A Department of Buildings ruling in favor of the General Theological Seminary at 180 10th Avenue is upsetting neighbors, who say that it stretches the law and sets a dangerous precedent by operating a commercial hotel out of its conference space. After a long-time dispute between the seminary and community members, the DOB ruled that the center could continue to run the hotel out of its Desmond Tutu Conference Center courtesy of a temporary certificate of occupancy. But, despite its claims that it is mostly using the space as a haven for conference attendees, neighbors say that the seminary has been advertising rooms for the space on popular vacation Web sites, opening up the facility to tenants unaffiliated with conferences or events at the space. While many of the money center banks are sitting on the sidelines when it comes to providing mortgage financing, Chinese, German and European financial institutions and insurance companies are dipping their feet into the water to provide much needed financing for commercial real estate. Foreign and domestic lenders and insurance companies prefer to lend to real estate investment trusts. A syndicate led by Westdeutsche ImmobilienBank is expected to close on a $135 million loan on the 25-story office tower at 300 Park Avenue. The 15 floors of the tower serve as the world headquarters for Colgate Palmolive. SL Green Realty closed on a $475 million refinancing of 1515 Broadway, home to Viacom International. The building, between 44th and 45th streets, is owned by SL Green in a joint venture with SITQ, or the Quebec Deposit and Investment Fund. A syndicate led by the Bank of China provided the new five-year, floating rate mortgage. SL Green and SITQ replaced the former $625 million mortgage that was due to mature in November this year with longer-term financing. A minority stake in the planned One World Trade Center is now up for sale, but the Port Authority of New York and New Jersey is not in a rush to settle on a partner for its Ground Zero tower. Though the agency has already reached out to an elite group of developers, seeking a minimum bid of $100 million in the 2.6 million-square-foot building, the deal will likely take six to eight months. The investment will help the Port Authority raise cash for the project formerly known as the Freedom Tower, which is scheduled for completion in 2013. The agency is hoping to get even more than the stated $100 million, and wants the winning bidder to take over marketing and leasing at the building, which already has leasing commitments for close to half of the building. The Port Authority of New York and New Jersey has asked a group of commercial real estate developers and owners to bid for a partnership interest in the $3.2 billion One World Trade Center tower, formerly known as the Freedom Tower, in an effort to raise $100 million for the project. The Port Authority is hoping that a partner would handle the marketing and leasing in what will be one of the most expensive office buildings. The World Trade Center site has been delayed due to legal woes between developer Larry Silverstein and the Port Authority, which are in the last stages of arbitration. A three-judge panel finished hearing the case in December, and the two sides hope it will rule in 2010. Leon Charney, owner of L.H. Charney, Peter Duncan, president of George Comfort, and 119 West 40th Street. Weeks after negotiating an agreement to rescue 119 West 40th Street from a mezzanine loan default, George Comfort & Sons and L.H. Charney Associates are facing foreclosure on a $160 million senior mortgage at the site. George Comfort and Charney originally borrowed $160 million from Wachovia Bank and Greenwich Capital Financial Partners in April 2007 with half coming from each bank. The loan was later sold to GS Mortgage Securities Corp. II, as part of a July 1, 2007, loan purchase deal signed between Greenwich and GS. In July 2009, Fitch Ratings warned that the 119 West 40th Street loan was performing below expectations. A proposal by a major medical group could force the closure of Greenwich Village's St. Vincent's Medical Center. The 160-year-old, 727-bed facility is the last Catholic hospital in the city and the only full-service hospital on the lower West Side. Continuum Health Partners, the operator of St. Luke's and Roosevelt hospitals in Manhattan that, together, form a medical complex adjacent to Columbia University, submitted the plan, under which it would take over St. Vincent's and convert it into a community health center, scaling back on its trauma and emergency center and rerouting surgical and in-patient services to other city hospitals. The nearest facilities are New York Downtown Hospital, Beth Israel, NYU and Bellevue and Roosevelt Hospital. The plan has the backing of GE Capital and TD Bank, which hold a combined $300 million in debt for St. Vincent's, and it also has the approval of the state. St. Vincent's plan to redevelop its campus with the Rudin Co. is now in question. Rudin planned to build a new, state-of-the-art medical facility, along with a market-rate condo complex on the site, and St. Vincent's recently received approval from the Landmarks Preservation Commission to move forward with its $1.6 billion facelift. The hospital is currently $700 million in debt, and in 2007, closed its Midtown hospital and sold off two others in Queens. Tishman Speyer and BlackRock Realty broke the news that they would turn over their massive Stuyvesant Town and Peter Cooper Village complex to creditors, in a move many are calling strategic default. SL Green renewed BMW of Manhattan's lease at 555 West 57th Street, pushing down the firm's average starting rent by nearly $11 a foot. The Manhattan-based real estate investment trust SL Green Realty lost $5 million in the fourth quarter, compared to a gain of $76 million in the same period last year. 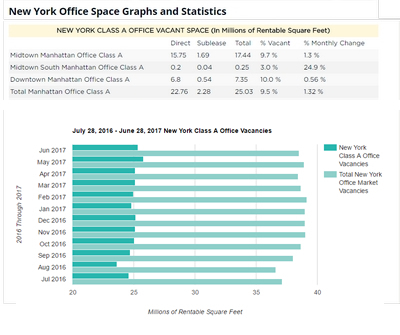 Manhattan's largest office landlord reported revenues of $246 million in the fourth quarter, the company's fourth quarter figures, a drop of 8 percent from revenues of $269 million in the same period last year. 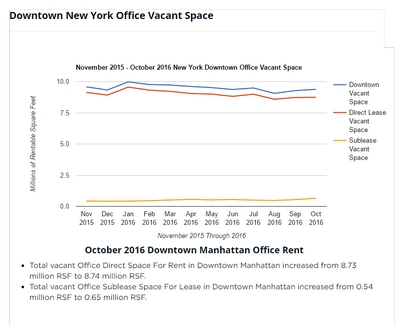 In addition, average starting rents in Manhattan for the REIT dropped by nearly a third in the fourth quarter from the prior quarter, in part due to a large early renewal lease in Clinton. The average starting rent fell by 30 percent to $33.05 per square foot in the fourth quarter from $47.31 per square foot in the third quarter. The rents for the 423,850 square feet the company leased in the fourth quarter were 2.4 percent higher than the fully escalated rents that were in place, but that increase was less than half the 5.2 percent rise above fully escalated rents in the third quarter, when 251,888 square feet was leased. The bankrupt New York City Off-Track Betting Corp. will shutter by March 30 without an outside infusion of cash. The OTB, which was taken over by the state after threatening to close down in early 2008, operates 65 betting parlors in the city and shares $1 billion in annual revenue with the state and city governments. A closure would mean 1,500 employee layoffs and $600 million in pensions and benefits for the state. Sam Chang is selling the Hampton Inn at 337 West 39th Street and the Candlewood Suites at 339 West 39th Street. Hersha Hospitality Trust, a Pennsylvania real estate investment trust, plans to spend $110 million it raised to buy two Midtown hotels developed by Sam Chang. Hersha will pay $54.3 million for the purchase of the 184-room Hampton Inn at 337 West 39th Street and $55.5 million for the 188-room Candlewood Suites next door at 339 West 39th Street. 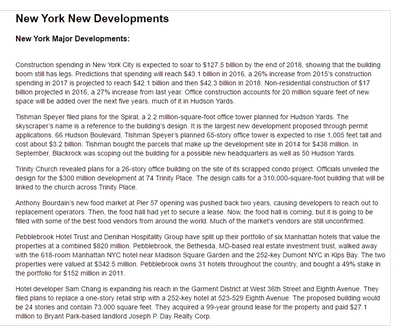 The two hotels, as well as a third hotel, a 210-room Holiday Inn Express at 343 West 39th Street, all between Eighth and Ninth avenues, were developed by Chang's McSam Hotel Group and opened in 2009, and were to be sold together last summer to Hersha. His company was still operating the third hotel at 343 West 39th Street, which remained available for sale. Hotel construction is at a standstill as lenders continue to tighten their belts to ward off further commercial real estate losses. With openings of just 717 hotels this year, it is 56 percent fewer than in 2009. 988 new hotel openings for 2010, but has led to a high number of project cancellations and postponements. In the fourth quarter of 2009, there were 767 hotel projects under construction, the lowest level in more than four years and that number is expected to fall further. Meanwhile, construction starts totaled 119 projects during the quarter, the lowest since the beginning of 2002. Though the drop-off in new hotel developments is bad news for the construction industry, hotel owners may breathe a sigh of relief as there will be fewer rooms than previously expected to absorb the increase in business and leisure travel. There are close to 100 new hotels to open in major U.S. cities this year with 46 of them in New York City. New additions to the market include Hyatt's 253-room Andaz hotel at 75 Wall Street, and the James Hotel, which is to open in Soho this summer. Tishman Speyer and BlackRock Realty, the owners of Stuyvesant Town and Peter Cooper Village, are turning the 110-building complex over to creditors in a deed-in-lieu of foreclosure. The partners went into default on the property after missing a $16.1 million debt payment this month. The complex was purchased for $5.4 billion in 2006, the most expensive single residential sale ever in the country, and it has $4.4 billion in debt. The property is worth an estimated $1.8 billion. Creditors had been threatening to move forward with foreclosure proceedings and to remove Tishman Speyer as property manager. Tishman Speyer invested $112 million in the property; and damage to the company's reputation is likely to be more palpable in the aftermath of the soured deal. Gramercy Capital, a Stuyvesant Town and Peter Cooper Village creditor, is pushing to remove Tishman Speyer Properties from its position as manager of the 80-acre property, which it bought with BlackRock Realty in 2006. Tishman and BlackRock had missed a $16.1 million debt payment, which may have spurred Gramercy Capital to push for the replacement. The removal of Tishman as property manager would need to be approved by CW Capital, special servicer for the senior portion of the debt. The commercial property firm Helmsley Spear, owned by embattled developer Kent Swig, is ending its third-party commercial brokerage operations to focus on managing its own assets and acquiring others. A division of Helmsley Spear is in negotiations to purchase several buildings, either commercial or multi-family, in New York City. Helmsley Spear may announce several new investment acquisitions over the next 30 to 60 days. The Lower Manhattan Development Corporation is closing in on a settlement with insurers of the former Deutsche Bank Building near the World Trade Center site, which was damaged on Sept. 11. The tower's $200 million demolition and decontamination project has been ongoing for many years. The insurers were obliged to pay 75 percent of the project's costs above $45 million that is roughly $113.5 million, of which they have paid just $63.5 million thus far. Demolition is expected to be completed before the end of the year. The building was originally 40 stories tall, and workers are now taking down the 23rd floor.